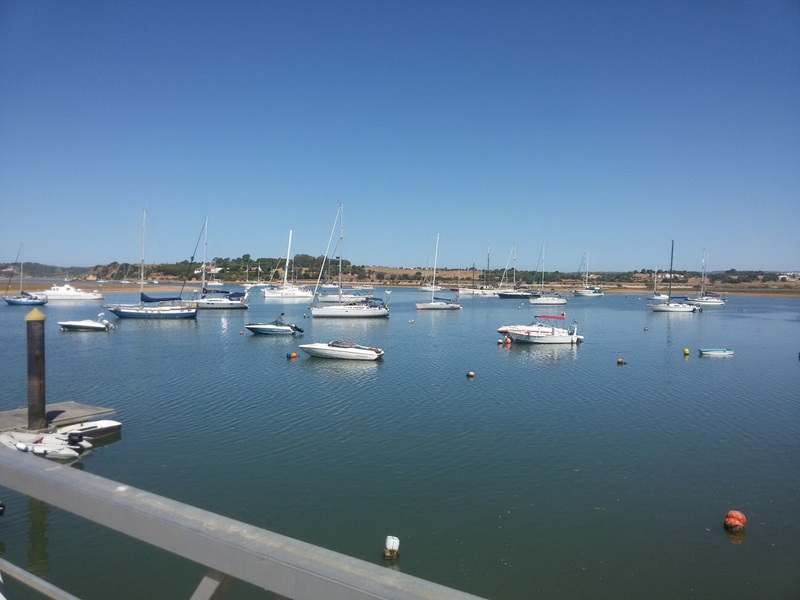 The Naked Boat and the Boatist: Sailing in the Algarve, One More Time! 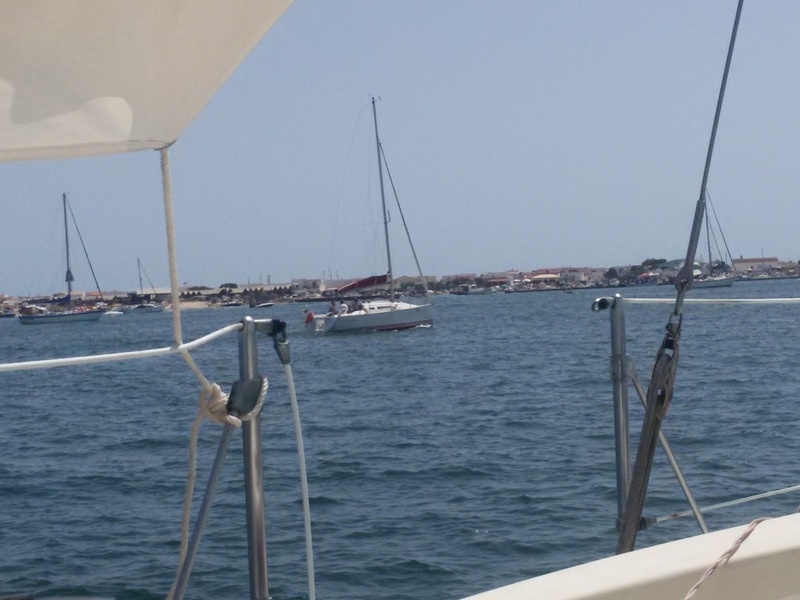 Sailing in the Algarve, One More Time! In Culatra on the kayak, taken with my cheap Rollei action cam. In the early morning of July 22, I untied the lines and sailed south solo. I sailed - using the sails - most of the way, in real sloppy seas most of the time. 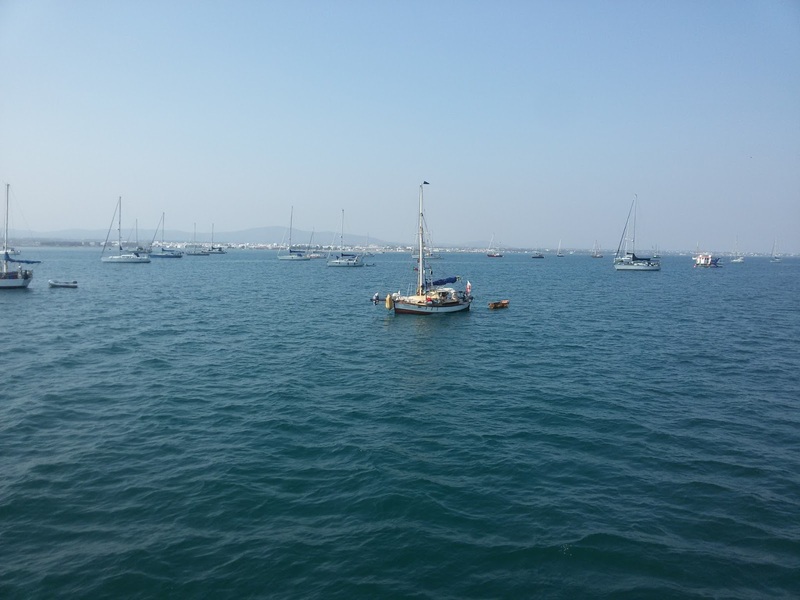 On the way, I anchored in Cascais, Sines, Alvor and Culatra. No marina for me. I did enter the Albufeira marina, but only for diesel and water. If you're planning to enter Alvor's inner anchorage, you'll need a rising tide to get in. The channel is a mess - and if you follow the buoys, you'll run aground good and proper. I saw a guy standing in water to his waist next to the green buoy!! No wonder hardly any boats venture into the anchorage anymore. The place is filled mostly with boats hanging on moorings, many of which are semi-abandoned. Anyway, I bought a Rollei action cam to film something interesting. That "something interesting" was possibly the fiercest conditions I've ever experienced sailing from Sagres to Lagos on a hot summer afternoon. On reaching Martinhal Beach, the wind came blasting from the hills like a sledgehammer, and I kicked myself for not putting in the third reef. 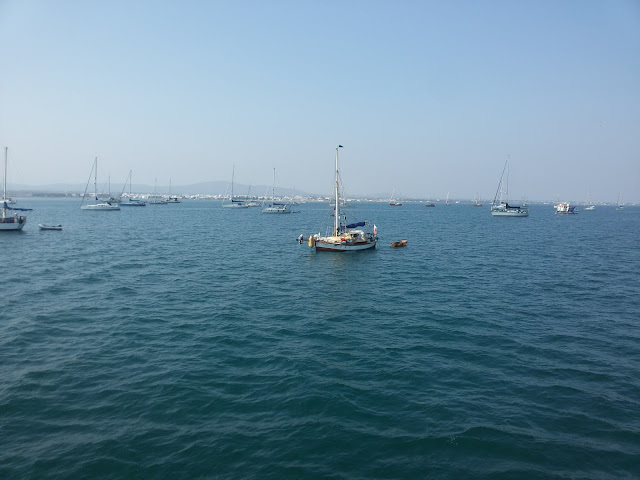 With three reefs, I could have had a decent sail to Alvor. Instead, with 2 reefs and the stay sail, I got a forced workout at the wheel doing 7+ knots, dodging a labyrinth of the usual lobster pots, with the odd wind-driven chop slapping the hull, spraying the deck and getting me wet. I was facing 14 miles of excitement and my Rollei action cam was somewhere down below doing nothing. Little details like that really piss me off. You had to be there, and you could have been there by watching it on film. Got wet and excited and nothing to show for it. On the way to Sines, I had an encounter with the ship. 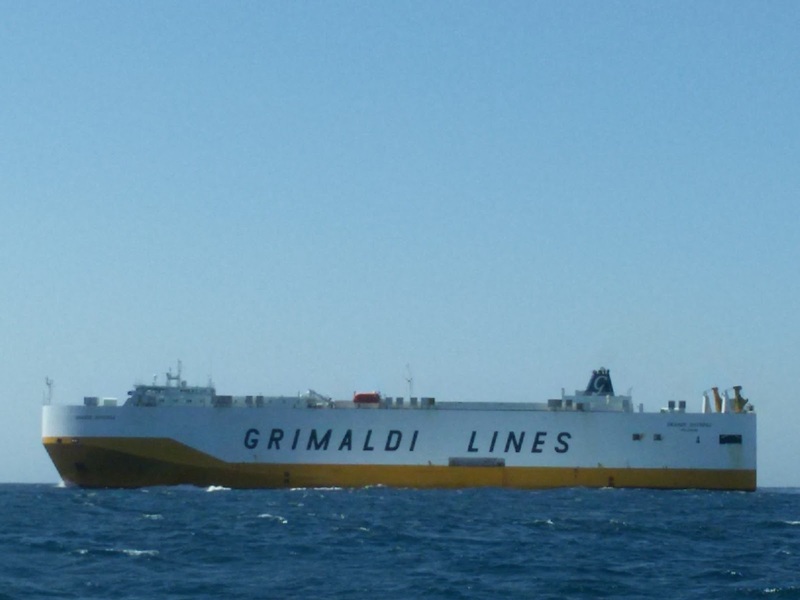 I was sailing, and he was approaching land going into Setubal, probably to pick up a load of cars. I had to change direction to avoid it, even though I had the right of way. Size matters. One lazy day in Culatra, hanging out on the boat, I had the privilege to witness another anchor dragging fiasco when the breeze picked up to a whopping 15 knots. A young (by cruiser standards) British guy on a big modern boat and I went to the rescue of three boats dragging as though they had a brick for an anchor. In one case, we were about to board a Spanish boat, when a barking dog charged through the companionway followed by a naked woman. She was having a siesta while the husband was at somebody else's boat. She popped down below to put on a T-shirt and shorts, came back out, started the engine and, motored around aimlessly dragging the anchor along the bottom until her husband arrived. Later, I saw what could be my future sailboat going by. 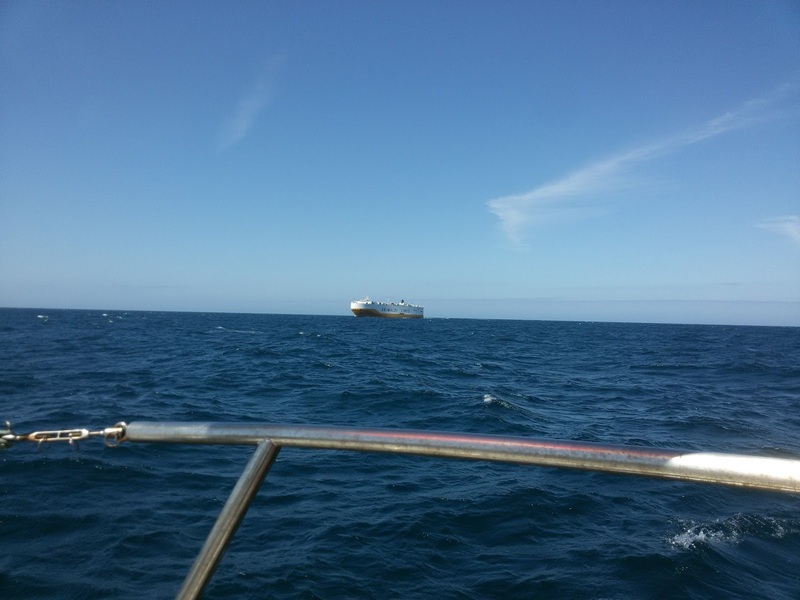 It looked really small from a distance, probably even more so up close, in an anchorage full of cruising boats. Sun Fast 26. Could it be the one? Bigger than the funky boat below. I was really curious to see the owner, and he was around because the boat moved a few times. But no luck. He/she either used it only to sleep or spent all the time sleeping down below in the tiny cabin. After 15 years of sailing to the Algarve, I'm beginning to feel repetitious. Instead of changing the destination, I think I'll change boats. Hey man, long time no see. I hear you on changing boats.....been thinking along those lines aswell, but that's another story. But will a smaller boat raise or lower the chances of seeing frantic naked ladies? The blog has been sitting in the back seat of the car called "life". Sailed to the Algarve and back and hardly took any pictures...maybe the trip is becoming too routine. Smaller boat? A guy bought a used 7 m sailboat and asked me to teach him how to sail. A truly naked boat - stable but fast - nothing aboard but sails and a compass, not even a battery. Had a blast. Didn't see any naked ladies, but can't blame the boat for that.